After these natural disasters, I always receive emails from our members who are concerned about how to go about saving their trees or what to do about their lawn. In addition to preparing your dwelling for a hurricane or tropical storm, be sure to store lawn ornaments and all lawn furniture. Stake all young trees. Mow the lawn. Short grass doesn't accumulate as much debris as tall grass lawns. With regular care and maintenance on landscape trees, shrubs and perennials, there should not be much to do to prepare them for a hurricane or tropical storm. When ready to deal with your outside area after any of these situations, the first thing you should do is to carefully check your lawn for all debris. Everything from nails to glass, branches and metal scraps can end up hiding in your lawn and landscape. Your next scheduled mowing could pick up more than you bargain for. With your garden hose, wash as much of the silt as possible from the remaining leaves on trees, shrubs, perennials, vegetables and lawn. Broken branches, defoliation, leaning trees, and cracked trunks are normal. So, let's discuss how to deal with them. One single piece of advice on caring for plants after such an event is that you should not apply fertilizer or other chemicals to trees, shrubs, grasses or perennials until they begin to come out of stress by putting on new growth. Get your pruners and small saws out. Prune all damaged branches back to the main trunk. Rather than clipping it flush with the trunk, clip the branch back to the point where you are leaving a one fourth to one half inch nub on the trunk. Cutting the branch flush leaves a larger wound and the plant is already stressed as it is. Most wounds will heal on their own and not need to be painted or wrapped. With temperature changes, wind, rain, and hail, expect leaves to be torn from the plants. It if is early enough in the growing season, the plants may generate new growth. In the late summer to early fall period, don't expect to see any new leaves unless you are in zone 9 and warmer. Just like people, plants experience stress and they may not produce new growth until the following year. On plants, which set their bloom buds in summer for the following year, you can expect those plants to be limited in their blooming the following spring as the bloom buds may have been knocked off during the storm. Young trees and shrubs can be easily straightened and secured to grow straight. Older, larger trees may require heavy machinery to straighten. You might consider calling in an arborist to see if the tree has a good chance for survival if straightened. 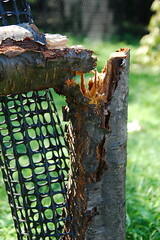 If the (main) trunk of a tree is cracked, it is likely that the tree will not survive. Young trees, shrubs, perennials, gardens and lawns are most affected by the saline dropped by rainfall from hurricanes and tropical storms. Let's address lawns first. The dried sediment accumulation on your lawn and around your landscape should not be tilled into the soil until you are certain that it does not contain high levels of saline. For large accumulations (more than a couple of inches) of sediment, scrape or otherwise remove it. High levels of salt in the soil will kill plants. Initially, the plants will appear as though they have been burned, but when replanting in the same spot, future plants will react the same way. If you are near the coast, you may want to have your soil tested for salinity. Remove all trees, shrubs, perennials and grasses that appear to be dead. If the sediment doesn't have saline, you can now till the sediment into the soil. At this time, it would be a good idea to also add in aged compost or other organic matter and if your soil compacts easily, add in coarse sand. Till well, level and reseed. With a light layer of silt, it may be necessary to aerate several times to break up the hardened sediment, while lawns that have been completely eroded may find it easier to completely re-establish their lawns. Fruits and vegetables aren't always at the top of the list to be concerned about. However, if your area experienced a hurricane, tropical storm or heavy flooding be cautious in eating from your garden as well as any locally grown produce as it could be contaminated with bacteria. Fruits and vegetables that were mature at the time of the disaster, should be disinfected, peeled and thoroughly cooked before eating. Leafy vegetables and fruits, such as berries, tomatoes, squash, are highly susceptible to bacteria contamination, while root crops such as beets, onions, and potatoes, are less susceptible but still should be disinfected, peeled and cooked. Immerse produce for 15 to 20 minutes in a chlorine solution, rise thoroughly with safe drinking water, peel and cook before eating. Again, rinse thoroughly with safe drinking water, peel and cook before eating. For more information on landscape care for pre and post hurricane, tropical storms and tornado weather read the Hurricane Information Series on the Louisiana State University Agricultural Extension Site. After Storm Check List on Trees and Structures. Trees that withstand hurricane winds and salt damage. Basic tree care after storms. How do you decide if a tree can be saved. How to save small uprooted trees. Article supplied by Greenwood Nursery Online Plant Nursery.